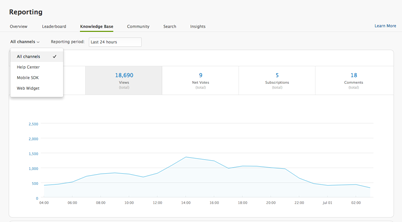 To more closely monitor how active your Help Center is, you can see activity data for the last 30 days for your knowledge base and community. This includes the number of new articles and questions created, how many users have viewed them, and the total number of votes, subscriptions, and comments. Help Center analytics is available on Guide Professional and Enterprise. The statistics are only visible to Guide Managers. Note: You must activate your knowledge base to view the knowledge base dashboard. Likewise, you must enable communities before you can view the community dashboard. For more information, see Getting started with Guide. You can view Help Center analytics through the Reporting dashboard. The Knowledge Base and Community tabs offer different options for viewing and filtering data. Click the Reporting icon ( ) in the sidebar, then click the Knowledge Base tab. 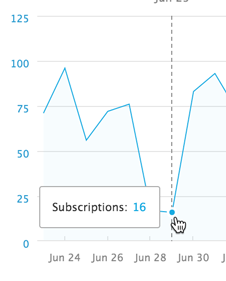 Click any of the five data sets at the top to drill down: Articles, Views, Net Votes, Subscriptions, or Comments. The Articles data set is open by default. Hover your mouse over a node to see the total number for that day. The Views data set allows you to filter the data by channel. 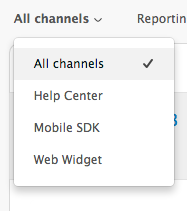 Click All channels to open the drop-down menu, and select All channels, Help Center, Mobile SDK, or Web Widget to display the data from a subset. Click the Reporting icon ( ) in the sidebar, then click the Community tab. Click any of the five data sets at the top to drill down: Questions, Views, Net Votes, Subscriptions, or Answers. The Questions data set is open by default. Help Center analytics gives you insight into which questions customers are most interested in. You can then take action based on this information. Here are several examples of how you can use analytics to provide better support to your customers. In your community, you can track what questions have not been answered within 24 hours (for example) and either respond to them or assign the question to an agent by creating a ticket. You'll want to ensure that your most popular articles are closely monitored and are always up to date. You can measure how effective your content is in creating deflection by answering questions before they are asked. For example, a high number of votes can indicate that an article is useful. An article with many comments can indicate that the content is confusing or incomplete and requires your customers to ask follow-up questions. Seconding Nicole and Jeff's comments - is there currently any plan to expand Insights (Good Data) to include the ability to report on Knowledge Base or Community activities, like we currently can with ticket data? Sorry for the delayed response on some of these comments. I wanted to connect with the appropriate folks to make sure I was able to give you good information on this. I'm in the same boat as y'all, and I definitely feel your pain on the reporting in HC! Luckily our Product Managers do as well, and it's something we plan to address this year. It's too early in the game to be able to give a ballpark on when it might be complete (this stuff can be complicated, after all), but it's definitely on our radar. I'd recommend keeping an eye on our Announcements Forum; that's the best way to keep on top of new features as they become available. I don't see the Community tab under Reporting. The Help Center dashboards are available on the Plus and Enterprise plans, so if you're on Starter or Regular that resource won't be available. Is there a link to the feature request posted by Leigh? "Would love to be able to see which users are viewing the content. Is that possible? Am I missing something? I am trying to determine which users and/or organizations are most active in the help center." I want to start tracking this information on a user or group level. Agent views and end-user views are currently counted as the same, and I can't distinguish between the two. I just checked, and Leigh never posted in the Product Feedback forum about this. As mentioned in my previous comment, we're working on getting reporting information into Insights for Help Center but we don't have any details to share on when that's going to be available. Be sure to keep an eye on our Announcements Forum; we'll let everyone know if/when a public beta becomes available as well as when it's officially released. Where can I see what you're building? Just looking to see if it would solve my reporting problem. There isn't anything to be shown publicly at this point, I'm afraid. What information are you looking to report on? I want to reward my agents for responding to forums, writing KB's, responding to comments. Secondly, understanding more on the user side, i.e. which users are reading, responding to posts. Thanks for sharing that info! I'll be sure to pass it along to the folks in charge of this initiative. I think that many people are interested in the same kind of information! That is essentially what I've been after all along, which is simply some logging to determine who is reviewing what articles. Seems like it should be low hanging fruit to implement. As is the case with many things in software development, there's a lot going on behind the scenes that make things more complicated than they might initially seem. Valuable, accurate reporting for Help Center is something that we want for ourselves and our customers, and we want to make sure we do it right. This means that it may take some time for us to get there. We'll keep everyone posted once there's information to share! I got an update regarding the Pathfinder application being available, which apparently will tell us if the ticket requester viewed any help center articles. Does this mean we can pull this data otherwise in reporting across the board, or is this minor visibility just restricted to the pathfinder app? Right now it's not possible to pull any metrics out of the Pathfinder app. There's actually a good conversation going on about this in the comments of this article: Installing and using the Pathfinder app. Hopefully there will be some useful information in there for you! I guess my feedback there is I shouldn't have to wait for the customer to submit a ticket to see what they viewed in the help center. I should simply have the reporting to see that regardless. I want to know what issues are being addressed via help center articles before a ticket even comes our way. This makes me think the enhancement is not to pathfinder, which appears to be a specific use case, but rather to insights or the reporting dashboard/leaderboard for the knowledge base. You're experiencing the same pain point that many of us are, myself included. We understand the need to have good reporting capabilities for the Help Center, and it's something that we're working on. There are thousands of actions to report on, though, and it takes a lot of time to get all the information put together and added into a reporting tool. We're getting closer. Please bear with us! My data analyst buddy and I were comparing the number of KB views in the ZD analytics dashboard to the number of views collected by our Snowplow instance. We have some filters applied in the query we're using (we filter out our company's IP) to calculate this and were surprised our number was higher than what ZD reported. While it wasn't substantially higher, we thought it curious, considering we're using exclusionary filters. This got us thinking - exactly how are the knowledge base activity metrics in the ZD analytics dash calculated? I found some articles about analyzing search activity, tickets, and agent stats, but nothing about this. If there's some documentation that I missed, I'd be grateful if you could send it my way. The views are a reflection of the number of views rather than the number of unique visitors so every click on the article would create one "view" for that article. The "Views (total)" tab on your Reporting>Knowledge Base page is for total views for all articles. If you scroll down on that page, you will see a list of your "top articles by number of views." Regarding why Snowplow's figures might be higher, that would depend upon how Snowplow counted views. If it's perhaps taking into account each unique URL that the user visited instead of just the articles, that could make it higher. Also each platform may be grabbing information at different times. Zendesk grabs the figures for your Help Center on about an hourly basis. If Snowplow is retrieving that data sooner, then it may have Views that Zendesk hasn't had the opportunity to factor into the reporting just yet. Is there a way to get a count of all my knowledge base articles? Is there a way to get a list of all my knowledge base articles that haven't been updated within a given time period? It's been over 3 months since we've heard back on this. My team just added quite a few articles in the knowledge base, I have nearly 100 views last month, and I still have no means to determine if this is my team just reviewing what they entered or if a client actually watched these and are taking advantage. How can we sell our leadership team on exposing clients to the portal if we can't report on how often it is used? Honestly, I'd take this reporting at the organizational level, if it's easier than showing individual users. Can you please provide an update and set expectations when we can see an enhancement to the portal in regards to this type of reporting? Thanks. I'll jump in on this one. Being able to measure the success of your Help Center is at the core of a great self service product. There isn't a person at Zendesk who believes otherwise and we are currently doing what we can to get you better metrics. Unfortunately we have a rather large infrastructure piece that we need to do before we can deliver metrics. Especially on Help Center where you can have thousands (or even millions) of requests, we need to have an infrastructure that can scale, so we don't suddenly lose data. From my perspective the worst thing we could do was to launch metrics that you couldn't trust. Unfortunately I can't yet say when the infrastructure and then Help Center metrics will be available, but it is definitely something we are working on. In the mean time I was wondering if you have tried using Google Analytics to measure your views? While I am no Google Analytics expert, it looks like you can filter out internal traffic. Obviously this is not a viable solution in the long run, but it might help you to get the metrics you are looking for now? Thanks for the explanation, but I'm afraid I don't follow completely. How could I use Google analytics to find specific organizations and/or users to hit pages? It seems that it would only allow me to filter internal views if I had an IP range, but that's not good enough unfortunately. Pathfinder starts to address some of the pain points, but not quite there. Maybe I misunderstood what you were trying to do. I thought you wanted to see how many visits a certain article had gotten excluding your own agents? I've tried re-reading your previous replies, but I am still not completely sure what you are trying to accomplish. Would you mind repeating or elaborating, so even the slow guy here can follow along? Sure. I simply want to track which articles my specific clients/organizations are viewing. Right now, all I have access to is a number count on the article in question and no user information. I have no visibility into which end user viewed it, nor do I know which organization that view came from. Even the latter would be helpful to tell me Client A was responsible for most of our page views. Does that make sense? Perhaps for this specific goal you're trying to achieve you could use separate trackers (like bit.ly or so) to track source by company or user. so you know which companies (A or B) clicked and visited more often within a time range. I would figure insight/GoodData would be able to handle that, considering how extensively it goes in other areas. Also, Pathfinder has already started to go in the direction of tagging users to particular knowledge base views. Yeah, it might not be possible to get views pertaining to a specific user or organization, although Google Analytics is a very powerful tool so there might be a way to group users and then see what they view. But I understand that it would take some effort to figure out the possibilities. I just wanted to mention it as an option. I want to report up the chain the number of help center views by quarter. However I don't see any view items available in Insights. Am I missing something or do you not provide it? I can also recommend using Google Analytics to track your views which will provide you with even more in-depth data about your users. Unfortunately, the Reporting > Knowledge Base solution can't easily show quarter by quarter changes the way Insights can. Will you submit the request as an enhancement? Thanks.